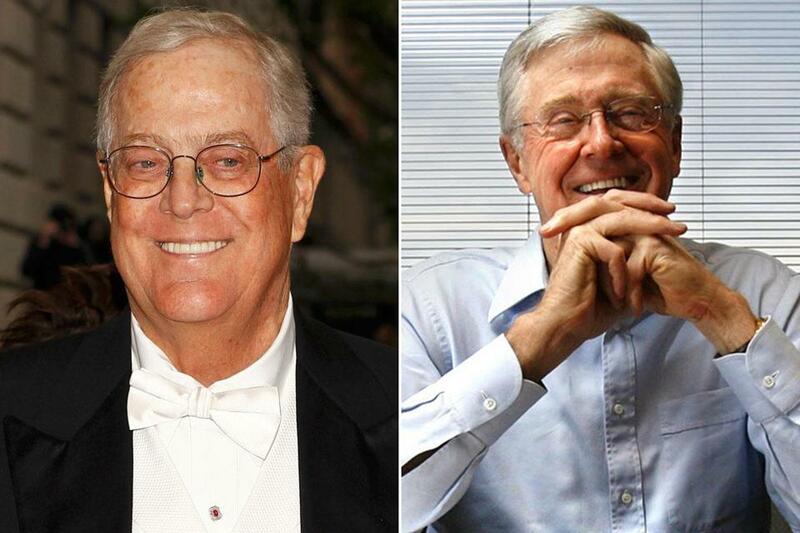 Brothers David (left) and Charles Koch. Charles has ramped up his spending on campus projects from his personal foundation to $100 million a year in 2017, from about $35 million in 2014. INDIAN WELLS, Calif. — Two Wellesley College students took the stage here at the Koch brothers’ winter retreat and described a lefty campus hostile to the conservative and libertarian ideas that the Kochs and their wealthy allies hold dear. “It is considered polite not to challenge authority,” said Kaila Webb, a Wellesley sophomore speaking to a gathering of roughly 550 Koch donors who paid at least $100,000 a year to attend. Margaret Flynn Sapia, a Wellesley junior, added that a “hazardous political climate” prevents students from voicing conservative views. Wellesley this week became the poster child for liberal intolerance, held up by the Kochs’ arch-conservative activist network as an example of how America’s higher education system is deeply flawed. And the billionaire Kochs are offering a solution: Wellesley, and other liberal colleges, can be reshaped by funneling money to choice projects within those institutions that are in synch with the Kochs and their allies’ broader libertarian philosophy that, among other aspects, promotes small government and unencumbered markets. Charles Koch, with an estimated net worth of $49 billion, has led the way by ramping up campus spending from his personal foundation to $100 million a year in 2017, from about $35 million in 2014, according to figures provided by the Charles Koch Foundation. The money underwrote projects at roughly 350 colleges and universities last year. At Wellesley, the Charles Koch Foundation supports the Freedom Project, an academic hub that highlights speakers challenging the conventional wisdom on issues, including conservative thinkers. The annual Koch retreat, officially a meeting of what the family calls its Seminar Network, was held last weekend at the Renaissance Esmeralda Indian Wells Resort & Spa in this desert city in Southern California. It provided a window into the workings of the Koch political empire, which encompasses a bewildering array of missions that today includes direct funding for Republican politicians, anti-union efforts, school choice initiatives, and, increasingly, projects pitched to them by professors who share at least some of their libertarian leanings. Charles and his brother David, who are the most active politically of four brothers, are notoriously secretive despite their heavy involvement in public life. Reporters covering the meetings had to agree to ground rules including not naming donors in attendance. Even the donors, some paying $5 million a year toward Koch priorities, faced restrictions. They had to place their cellphones into locked pouches as a safeguard against surreptitious recordings. But some public glimpses of the network in action were provided. A panel on higher education was partially open to journalists. “Many folks are asking if higher education in this country is having a positive impact on the direction of this country,” said John Hardin, the director of university relations at the Charles Koch Foundation, said before bringing the Wellesley students on stage to discuss the Koch-funded Freedom Project, which is aimed at — from the Kochs’ perspective — improving campus culture. But critics say there’s reason to be suspicious of these initiatives. The Kochs have a history of trying to attach conditions to their donations. At Florida State University, the Kochs tried to control the curriculum and some hiring in the economics department in exchange for giving millions of dollars, according to the Center for Public Integrity, which has closely tracked Koch giving. They’ve also used their education dollars to elevate climate-change deniers, including Willie Soon, a solar researcher at Harvard-Smithsonian Center for Astrophysics who called predictions of catastrophic ocean tides “crazy.” That belief puts him at odds with most scientists. Over the weekend the Mercatus Center at George Mason University, which describes itself as “the world’s premier university source for market-oriented ideas,” was specifically credited with doing the academic work to support the $1.5 trillion tax cut passed in December. It has benefited from tens of millions of dollars from Koch groups. “That research turned out to be absolutely essential to cut through the propaganda that was put out by the cronies and the special interests who were opposing reform,” said Brian Hooks, the Seminar Network co-chairman and former Mercatus executive director, addressing donors over the weekend. Wellesley served a different role in the conversation: As a stand-in for liberal intolerance, it was meant to galvanize donors to take matters into their own hands, and try to tilt the collegiate discourse toward the right. Lynn Pasquerella, president of the Association of American Colleges and Universities, said that the higher education world has been watching closely. “The Kochs have been an increasingly visible force on college campuses at a time when there is widespread criticism by conservative voices that higher education promotes progressive liberal causes,” Pasquerella said. She said the “concern” for many is whether the Kochs are trying to control curriculum and faculty hiring. At Wellesley, the Kochs don’t have influence over picking teaching fellows or speakers. Still, their ideological bent raises concerns from those who pay close attention to university giving. But Botstein said that elite colleges like Wellesley are adept at sidestepping the more extreme inclinations or intentions of donors, and tend to find ways to accept large gifts and spend the money in ways that don’t undermine the institution. “I think Wellesley can outrun the Kochs,” Botstein said. Sofiya Cabalquinto, a spokeswoman for Wellesley College, said the Koch money is overseen by the college. “The Freedom Project is just one of many ways in which Wellesley students engage in a diversity of political viewpoints and participate in critical thinking and debate,” she said. She didn’t comment directly on how the college atmosphere was described by students. “Wellesley embraces the diversity of viewpoints held by our students, and the College encourages all students to make their voices heard,” she said. The project at Wellesley started when Thomas Cushman, a sociology professor at the college, applied to the Kochs for a grant to bring speakers to campus. He started with $10,000. Seeding individual professors or departments with money is a common strategy for the Kochs, who encourage professors to apply directly for grants. But the Koch Foundation liked what they saw Cushman doing at Wellesley, and Cushman wanted a more ambitious program — so in 2016 the Charles Koch Foundation gave him a $1 million grant to supersize the project. The Kochs also helped persuade two other donors with ties to the college, George and Nancy Records, to join their effort instead of giving unrestricted money to the college. “They had a check ready to go — they hit the pause button,” Hardin told donors. In the end the Recordses also gave $1 million to the Freedom Project. “We increased the amount we were planning to give to meet the program’s needs, and have been happy to learn how much students value it,” said George Records, the former chairman of the Midland Group in Oklahoma, in a statement e-mailed to the Globe. Wellesley’s Freedom Project now includes up to 24 student fellows who apply to be part of it, and funds postdoctoral fellows to do research and teach some classes at the college. Speakers have included Columbia University’s Mark Lilla, who is critical of identity politics, and Northwestern University’s Laura Kipnis, who has questioned policies barring sexual relationships between students and teachers at colleges and universities. And the program welcomed libertarian author Charles Murray, who was shouted down during a speech at Middlebury College. Cushman said there have been some protests to his program at Wellesley, but that he also has a well of support. He said he has control over the program and isn’t beholden to donors. When Cushman was asked if he would consider a speaker like Jane Mayer, the New Yorker writer and author of “Dark Money: The Hidden History of Billionaires,” a book that’s highly critical of the Koch brothers, the answer was no. can be reached at annie.linskey@globe.com. Follow her on Twitter @annielinskey.